stuck on older versions of sql server? check out our trace commands. If you’re still using super old versions of SQL Server and don’t have access to awesome XEvents, we’ve got some commands to help simplify trace management. 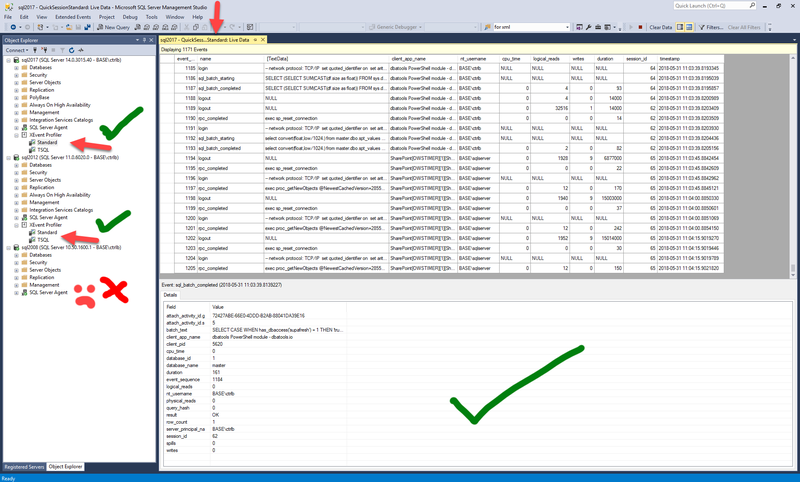 Just a quick note, if you use newer versions of SQL Server and haven’t seen the XEvents Profiler in SSMS 17, it’s awesome! In my experience, it’s much faster than using Profiler and just as useful. Sadly, however, it’s only available for SQL Server version 2012 and up. 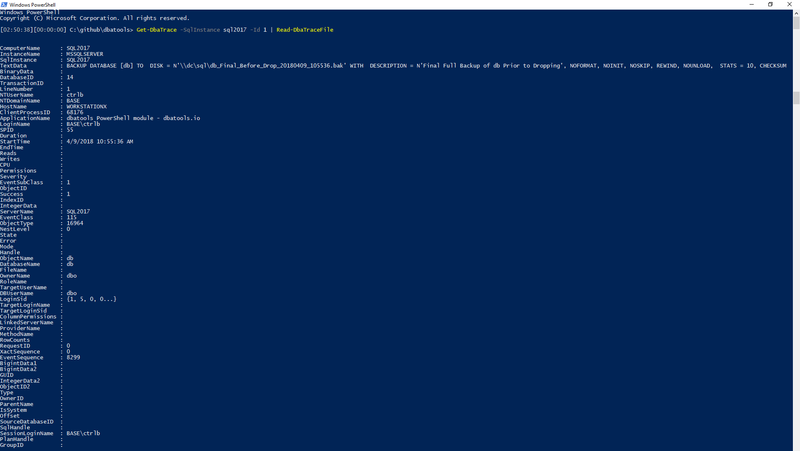 Traces are less exciting than Extended Events, but PowerShell makes them kinda fun to work with (at least for me). As with most of our commands, multiple servers are supported. Check out the list of traces across my lab. This information was gathered in 324ms! 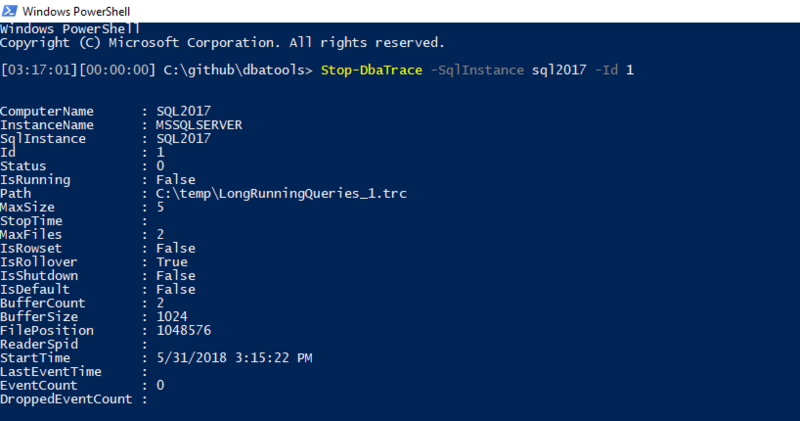 # Read every trace file on sql2014 Get-DbaTrace -SqlInstance sql2014 | Read-DbaTraceFile # Read the tracefile C:\traces\big.trc, stored on sql2016. Filter only results that have master or tempdb as the DatabaseName. Read-DbaTraceFile -SqlInstance sql2016 -Database master, tempdb -Path C:\traces\big.trc # Read the tracefile C:\traces\big.trc, stored on sql2016. Filter only results that have master or tempdb as the DatabaseName and that have 'EXEC SP_PROCOPTION' somewhere in the text. Read-DbaTraceFile -SqlInstance sql2016 -Database master, tempdb -Path C:\traces\big.trc -TextData 'EXEC SP_PROCOPTION' # Read the tracefile C:\traces\big.trc, stored on sql2016. Filter only results where LinkServerName = myls and StartTime is greater than '5/30/2017 4:27:52 PM'. Read-DbaTraceFile -SqlInstance sql2016 -Path C:\traces\big.trc -Where "LinkedServerName = 'myls' and StartTime > '5/30/2017 4:27:52 PM'"
# Read the tracefile C:\traces\big.trc, stored on sql2016. Filter only results that have master or tempdb as the DatabaseName. # Read the tracefile C:\traces\big.trc, stored on sql2016. Filter only results that have master or tempdb as the DatabaseName and that have 'EXEC SP_PROCOPTION' somewhere in the text. # Read the tracefile C:\traces\big.trc, stored on sql2016. Filter only results where LinkServerName = myls and StartTime is greater than '5/30/2017 4:27:52 PM'. 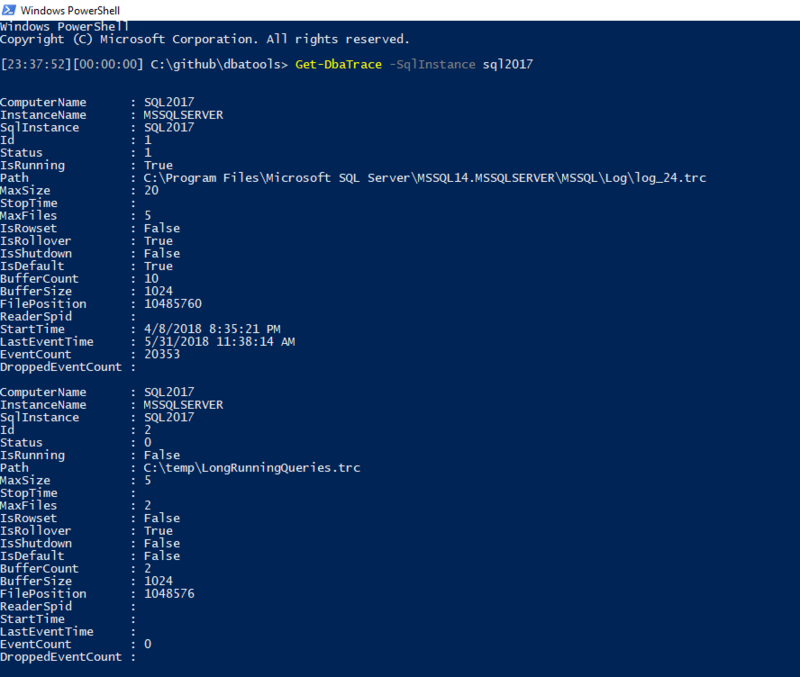 Read-DbaTraceFile -SqlInstance sql2016 -Path C:\traces\big.trc -Where "LinkedServerName = 'myls' and StartTime > '5/30/2017 4:27:52 PM'"
These commands really highlight my favorite thing about managing SQL Server with PowerShell. First, you can manage multiple servers as easily as managing one, and the naming convention is straight forward and easy to remember. This is very nice! This will save me from having to RDP into the server to read the trace file(s). How would one define a trace with this? I see start, stop, remove, get but where’s new or add? Defining it would only be via T-SQL. Similar to creating a new Extended Event, it was just too complicated.